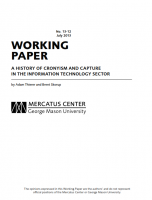 The Mercatus Center at George Mason University has just released a new paper by Brent Skorup and me entitled, “A History of Cronyism and Capture in the Information Technology Sector.” In this 73-page working paper, which we hope to place in a law review or political science journal shortly, we document the evolution of government-granted privileges, or “cronyism,” in the information and communications technology marketplace and in the media-producing sectors. Specifically, we offer detailed histories of rent-seeking and regulatory capture in: the early history of the telephony and spectrum licensing in the United States; local cable TV franchising; the universal service system; the digital TV transition in the 1990s; and modern video marketplace regulation (i.e., must-carry and retransmission consent rules, among others. 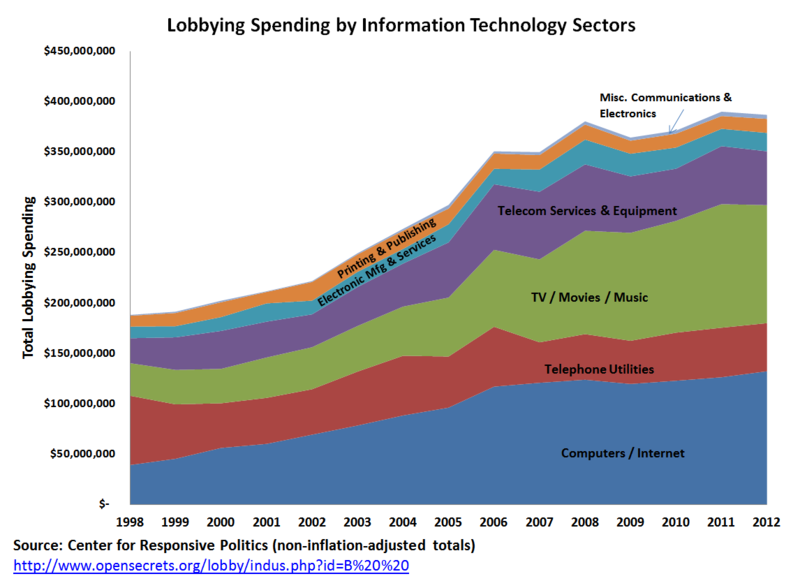 Our paper also shows how cronyism is slowly creeping into new high-technology sectors.We document how Internet companies and other high-tech giants are among the fastest-growing lobbying shops in Washington these days. According to the Center for Responsive Politics, lobbying spending by information technology sectors has almost doubled since the turn of the century, from roughly $200 million in 2000 to $390 million in 2012. The computing and Internet sector has been responsible for most of that growth in recent years. Worse yet, we document how many of these high-tech firms are increasingly seeking and receiving government favors, mostly in the form of targeted tax breaks or incentives. We argue that the creeping cronyism could have two major negative ramifications. First, it could dull entrepreneurialism and competition in this highly innovative sector since time and resources spent on influencing politicians and capturing regulators cannot be spent competing and innovating in the marketplace. Cronyism will also negatively impact consumer welfare by denying consumers more and better products and services. Additionally, consumers might end up paying higher prices or higher taxes due to government privileges for industry. Second, cronyism also raises the specter of greater government control of the Internet and of the digital economy. When policymakers dispense favors, they usually expect something in return. They also become accustomed to having greater informal powers over the sector receiving favors, and contribute to DC’s infamous “revolving door” problem. High-tech America’s recent embrace of Washington could take it down the familiar path followed by the agriculture, telecommunications, and automotive sectors (among many others), with government becoming both protector and punisher of industry. Today’s dynamic tech industries will increasingly come under the “Mother, may I?” permission-based regulatory regime that encumbered the older information technology sectors. Next post: What Are We Going to Do after COPPA Fails?